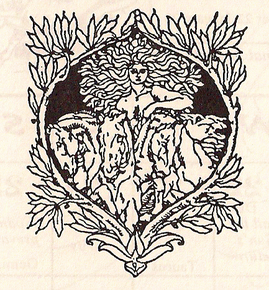 --Welcome to our Winter selves and to the gestating Season of the Soul. We may review and release the old, the past, the wild Green innocence of Summer. We are moving together toward the Winter of our Deepest Content--literally. The content of our lives is full. The Harvest of the passing year has been gathered. We pause in the Cycles of the Seasons to give thanks and pay tribute to Nature and all of those around us, our extended life family in every realm. The Green Man is mature and ruddy of face. Soon he will arise as the Father of Frost, Ice and Snow. As the Earth folds inward in meditation, we can also develop the art of contemplation, consideration and calm. There is no hurry. The fruits of our labors are ready to be shared throughout the winter. We re-member all of the Relatives--the 2-leggeds, 4-leggeds. All those who have passed on. We honor our Ancestors and feed the Sacred in our lives. 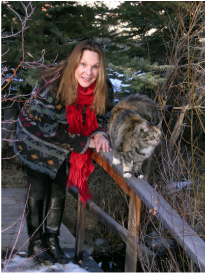 Marcie Telander and Feline Familiar, Guinevere welcoming the turn from green and gold to snow. Here is what is moving now as we savor the Sacred Autumn celebrations and our dedication to Generosity of Spirit and Communal Harvest Ceremony. *For more expansive and deeper consideration of these internal psychic Winter life-stage changes you may wish to read about the MYSTERY SCHOOL Internships and phone, Skype, online teachings below. As we welcome the dramatic Farewell of Leaf-Fall we may embrace our own recognition of the ongoing personal harvest, death and rebirth of this unique transformational season. And, remember, these shifts in Seasonal Cycle Awareness are very positive! They are the steps we need to take, in order to place our inner Lunar Work directly into the outer, Solar World. We are opening ourselves to the Action combination of required risk-taking and careful planning for the Winter. These transforming solar transitions which are currently moving across the inner lunar landscape also beckon the best time for sacred Purpose-stretching and immediate Life-Stage change. If not You, Who? If not Now, When. If not Here, Where? What is the next best step in your Sacred Life? Enter full Autumn and the harvest of past loss and current wisdom by committing more deeply and directly to your healing service to the Planet. Ground this intention with Action. This is the perfect season to root yourself in the Sacred Place where you wish to establish your authentic identity as a Practitioner of Integrative Healing Ways. FINDING HOME: Celebrating Sacred Space is what the 2018-19 Autumn-into-Winter dynamic is inviting you to do. If you are not where you wish to be---Now is the time to begin that move to your Healing Home. For this transformational transition time--- WHERE is even more important than WHO. Even if you simply move into another room in your apartment, share a studio with another healing practitioner, renovate a shed as healing space in the back yard, or make the move across country---Now is the time. Because the Autumn harvest reminds us of the importance of home, hearth and healing, we often consider how important it is to practice the simple art of Staying Put. Choosing to love where we live, live where we love, dwell and inhabit with commitment and renewed intentions. 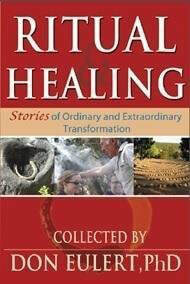 Please click on the book image above for more information and access to my essay, "FINDING HOME: Celebrating Sacred Space" for encouragement and inspiration that will move you--in the award-winning collection RITUAL AND HEALING: STORIES OF ORDINARY AND EXTRAORDINARY TRANSFORMATION (Motivational Press, 2015.) This richly personal and intimate collection, 8 years in the gathering by Don Eulert, PhD, includes the works of international visionaries and spiritual pilgrims such as Starhawk, Gary Snyder, Melidoma Some, Ralph Metzner and many more. You can read excerpts and/or order through or order from your local independent bookseller. --wish to live ever closer to the timeless Mysteries of Earth and Nature? --yearn for sacred ritual to be a daily part of your life, family, group, community? --long for a supportive, intentional online Tribe with whom to communicate your spiritual exploration? --desire to heighten and utilize your powerful and unique gifts of Intuition and Healing Arts? --dream of apprenticing with a life-long Practitioner of the Mysteries of Earth Wisdom? --want to learn ancient and perennial Medicine Teachings designed to apply to actual, contemporary life?